The space outside of our toddler’s bedroom has always been a hot mess (see below for proof). There’s this awkward air vent stuck in the corner with a surface just big enough to collect baby shoes, coats, purses and crap. And it’s basically the first thing you see when you walk in our front door, so it’d been irking me for a long while. But with a tight budget and little free time on our hands, we’d been putting it off. Until a long weekend rolled around and we knew it was about damn time we tackled this space with some creativity and just a little bit of cash. I’d been thinking about ways to organize toddler shoes for a long while, but couldn’t find any baby shoe racks that made me happy. Plus we needed something very specific in size to fit on top of our weird air vent. So with a white wall, white air vent, we decided on a white shoe shelf…but that felt very boring. Inspired by other cloud designs I’d seen online, we dreamed up a little cloud shoe rack that’s wide and deep enough for about 8 pairs of shoes. Dowels keep them from sliding off and there’s room for her feet to grow. We added a board above with pegs for hanging coats and bags, plus a shelf on top for decor. It’s been just a few days since we finished it and I’m already feeling much more organized. It’s amazing how much easier it is to stay on top of things once you have a system in place. Here’s how we pulled it off in a single day for less than $50 total. 1. To make the clouds, cut two pieces of 1” board to fit your space. Freehand the cloud design on one of the boards using a pencil, then clamp the two boards together so you only have to make one cut for both boards. 2. Using a jigsaw (we rented one at Home Depot for $12 for 4 hours), cut the clouds out of the board and use an electric sander to soften the edges. 3. To create the shoe shelf, measure and cut a 1” thick board to the length of your given space. We figured out that we could fit two rows of shoes on a single board using 1/2” thick dowels to separate the rows. Cut the dowels the same distance as the shelf and figure out where you plan to position them. 4. Make pilot holes into the dowel ends so they don’t split when you start screwing (this is vital). Additionally, pre-drill holes on either end of the shelf, and pre-drill holes into the cloud that will align with those in the shelf. You’ll also want to counter sink pilot holes on the outside of the clouds so the screws will eventually sit flush. 5. Paint the clouds white. Let dry. 6. Attach everything together via 1¼ #8 screws. Use a putty knife and spackle to cover any screws that are showing. Once dry, add a final coat of white paint. 1. Cut 1” thick boards following the measurements of your given space. One will serve as the rail for your pegs, the other for your upper shelf. 2. 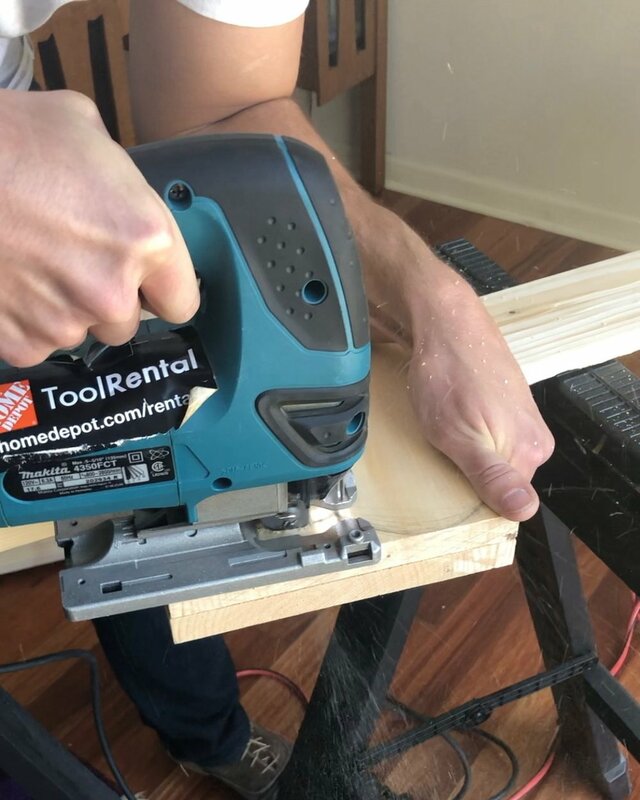 Clamp the boards at a right angle, then connect them with at least four screws (remember to do the whole pilot holes and counter-sinking song and dance). 3. Drill a series of equally-spaced pilot holes along the back of the rail board; counter sink holes in the front of that same board. 4. To create shelf brackets that will give the whole thing a more finished look, draw and cut them out (using that same jigsaw) of leftover wood. I love that ours mimic the shape of the clouds below. 5. Paint the boards and the brackets, but not the pegs (go ahead and drill pilot holes in those). 6. To attach the pegs to their railing, drill screws through the back of the board into the pegs. Then screw the whole thing into the wall with drywall anchors. 7. Finally, attach the brackets to the shelf with wood glue. Once dry, use spackle and a putty knife to fill any gaps. Add a final coat of white paint.